A uniform and organized mailing list. Your subscribers, your leads, all those to whom you wish to deliver email content, and who have agreed to receive such content. These are your contacts, and they are the single most important asset to your email marketing, or rather, digital marketing efforts. Without them, to whom will you send your newsletters and campaigns? Consequently, managing these contacts, the information you have about them and the lists of contacts to whom you send specific mailings, is of utmost importance. Don’t fret, however, at ActiveTrail we’ve got you covered with a complete set of sophisticated, but simple to use contact management tools. We have already established that, as an email marketer, your success depends on your database of contacts, but just having a long directory of contacts isn’t nearly sufficient. To be able to send your contacts content relevant to them, information that they are interested in, you need to divide up your contacts into groups, i.e. mailing lists. The first step to creating and managing mailing lists in ActiveTrail is to bring your existing lists of contacts into the system. Our state-of-the-art system allows you to, easily and efficiently, import existing mailing lists from Excel files directly into the ActiveTrail interface. From here, it is a very short distance until your newsletter will show up in your subscribers’ mailboxes! Start by logging onto the ActiveTrail system. On the homepage click on the “Import” button located under the “Contacts” category (you can also do this via the “Contacts” option on the top menu bar). The system will then prompt you to select an Excel readable file from your computer, giving you the flexibility to import any file type that you may require, whether it be an Excel file, xls, csv, the list of contacts from your Gmail account or lists taken from an internal CRM system. Not so sure that your Excel table is setup correctly? To help you achieve better results when importing your contacts, we offer a sample Excel file template that allows you to see how your file should be structured. After selecting the desired list, the system will display a window with fields that should be filled in accordance with each contact group’s data – email addresses, first name and last name. 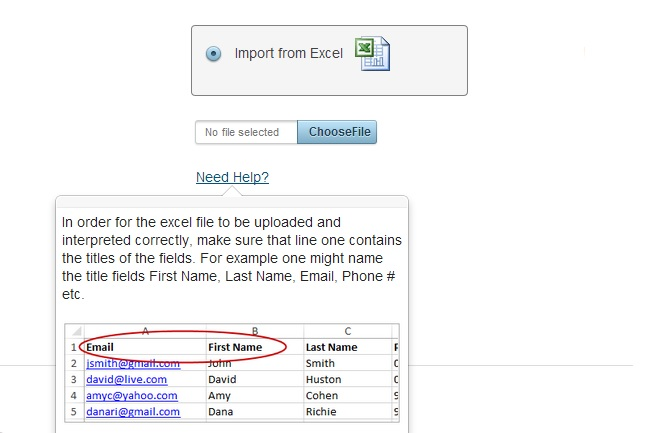 You can edit the fields by adding a personalized field or removing an existing field. Similarly, if there is information that you aren’t interested in importing to the new file, you can simply filter it out from your list. Once the list has finished uploading you will receive a personal notification to your inbox. That’s it, couldn’t be easier. Importing existing lists, while made technically easy by ActiveTrail, may not, however, be a trivial procedure. Many of us already have an assortment of mailing lists from different sources, something that can make our processes cumbersome vis-a-vis our customers. As such, we have extended the ActiveTrail import facility to provide you with a simpler way to manage multiple groups and lists of contacts, accumulated from different sources such as Gmail inboxes, external CRM systems, mobile phones and more. Import all of your lists of contacts directly into the system, and create, with a single press of a button, a well organized and up to date mailing list. All this, without limiting the number of contacts in each list. You can then group your contacts by categories such as: form of registration, geographic location, client type and more. Such a partitioning of your subscribers will allow you to better track consumer behavior and will increase the efficacy of your newsletter. As soon as you finish importing the relevant files, the system will generate your new mailing list. This list will help you streamline your email campaigns. During the import process, duplicate and erroneous email addresses will be automatically deleted, such that the newly formed file will contain only current and relevant information. Should you wish to do so, you can produce a report with the updated information to use, later on, for other business purposes. Now, that the complete list is in the system, you can send mailings to the entire list or to specific groups. Filters and dynamic groups let you segment your mailing lists into a number of groups with various common denominators to deliver more relevant content to your subscribers. Would you like to know what your users are doing on an individual basis? The ActiveTrail system allows you to view each of your recipients’ activity on an individual basis, and to see what links they clicked on, which campaigns they opened and how often they did so. 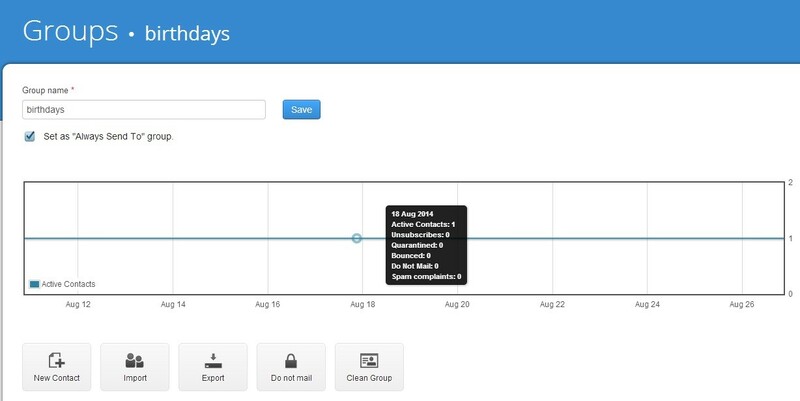 ActiveTrail, lets you view this data up to 90 days back in time. With this information in hand, you can study your subscribers and their habits, allowing you to optimize campaigns that you intend to send them in the future. For instance, if you observe that a certain subscriber only opens promotional campaigns, perhaps you should conduct an experiment, and include him or her in a “promotions only” subscriber group. In this way, you will minimize the number of mailings the subscriber receives and ensure that the ones that are sent to him or her will peak their interest. To extract information on a specified user, all you need to do is click on “Contacts” on the top system menu and then select the contact of choice. 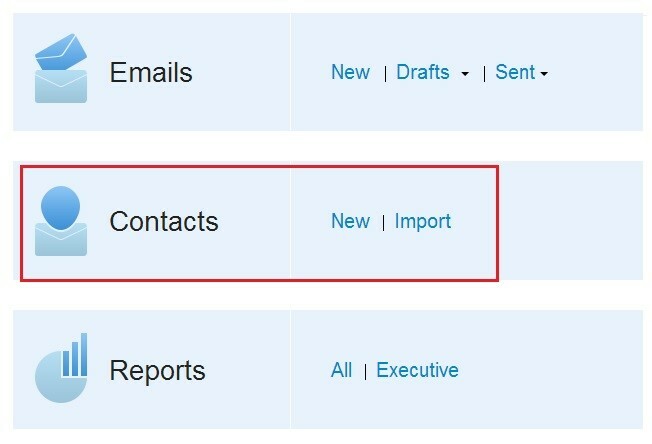 All of the selected contact’s information will be displayed: name, address, status, date of last update, group associations, number of campaigns opened and more. Save your campaign data in separate files, use it in presentations and share it with your colleagues. ActiveTrail’s advanced reporting system provides a complete picture of each of your campaigns and their results. This information is important to the success of future campaigns, and it is easier to analyze when presented in an orderly and detailed Excel spreadsheet. With a single press of a button all of the information is provided to you in a csv file, organized into columns and including all of the important data elements you could possibly think of: from general data, such as campaign names and dates, to number-of-click-throughs, opening rates, unsubscribes, social media shares and more. Interested in saving your data in PDF format on a regular basis? Set a date and frequency in ActiveTrail’s automated reporting system, and the PDF reports will be sent directly to your mailbox. Nothing could be simpler. Thinking of convening a “creative” session to discuss campaign design with your teammates? ActiveTrail allows you to export your campaign templates into PDF files. You can incorporate these files into slideshows, share them by email or print and hang them in your office. ActiveTrail makes it simple to access the information stored in your account. 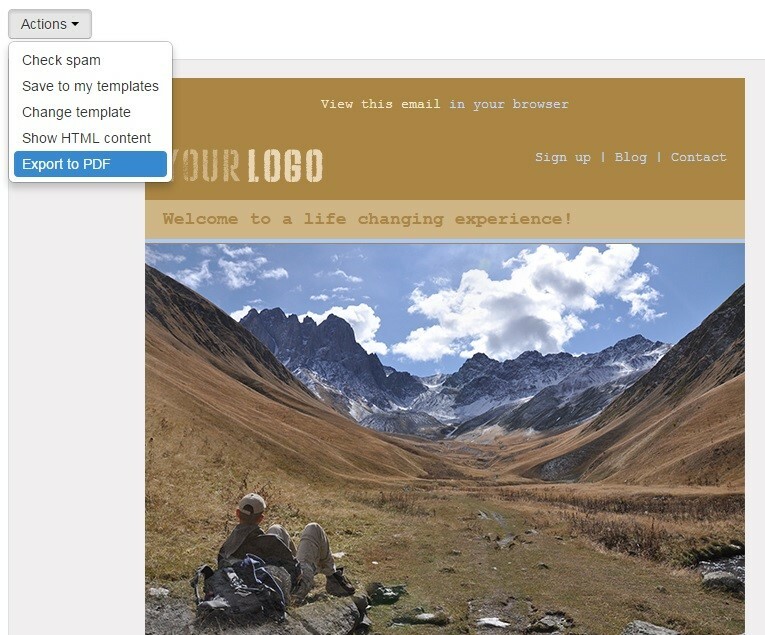 Fear of the SPAM box is ever present when sending email marketing campaigns. At ActiveTrail we have taken this concern to heart. Consequently, we have designed our system to do everything possible – automatically – to ensure 100% deliverability rates. At present, most countries have already enacted anti-SPAM laws that, amongst others, require adding an “Unsubscribe” button to all marketing emails. In the ActiveTrail system, such a button is automatically added to any email that you create. The link associated with the Unsubscribe button will synchronize with your ActiveTrail account, such that any click on the button will cause the contact to be removed from your mailing list. Once a subscriber has been automatically deleted from your list, he or she has no reason to report your mail as SPAM, and you can be safe with the knowledge that your campaigns are reaching only those who are interested in receiving them. Would you like to know who clicked on the Unsubscribe button, and when? Our advanced reporting system will present all of the data to you, in real time, separately for each campaign and for all of your campaigns together. Your marketing campaigns are not SPAM and there is no reason they should end up in a SPAM folder. ENSURE high deliverability rates with ActiveTrail. We have put substantial effort into the ActiveTrail email marketing system to give you the means to rapidly and simply deliver your content to the correct audiences. Once you have sent your newsletter or campaign to the appropriate contacts in a fraction of the time it might typically take you, you are free to deal with more important matters, namely, running your business!